Today I'm going to show you how to cut a pineapple without wasting anything, as taught to me by my grandma. In the 1940s, when my grandma was just a few months old, my great grandparents moved the family to Hawaii. They lived there for several years and grandma brought her love of the fresh pineapple home with her. I was visiting her a few weeks ago and she had the most beautiful fresh pineapple tidbits to accompany our chips and sandwiches for lunch. I asked her to teach me the fine art of choosing and cutting a fresh pineapple so she came by my place the next week and I had a good one waiting for her. While they still lived in Hawaii, a couple of sisters from the Philippines owned a local produce stand. They would occasionally babysit my grandma and her brothers and she learned the art of the pineapple from them. A nice ripe pineapple is such a treat. It should be fairly golden throughout but especially near the bottom. Grandma says that if its still a bit green towards the top, it's fine, as long as it follows the other rules of ripeness. The center leaves should pop out or wiggle easily and the tips of the leaves should be starting to get dry. If they are very dry and falling out, the pineapple is rotting. The bottom of the pineapple should smell fantastic and the skin should be a tiny bit soft. If its too squishy, it's a goner. Now this is a critical step according to grandma and the sisters from the produce stand- the night before you're ready to cut the pineapple, set it in the corner of your kitchen counter upside down. The sweet juices that have settled to the bottom will run all throughout the pineapple and make it all taste divine. 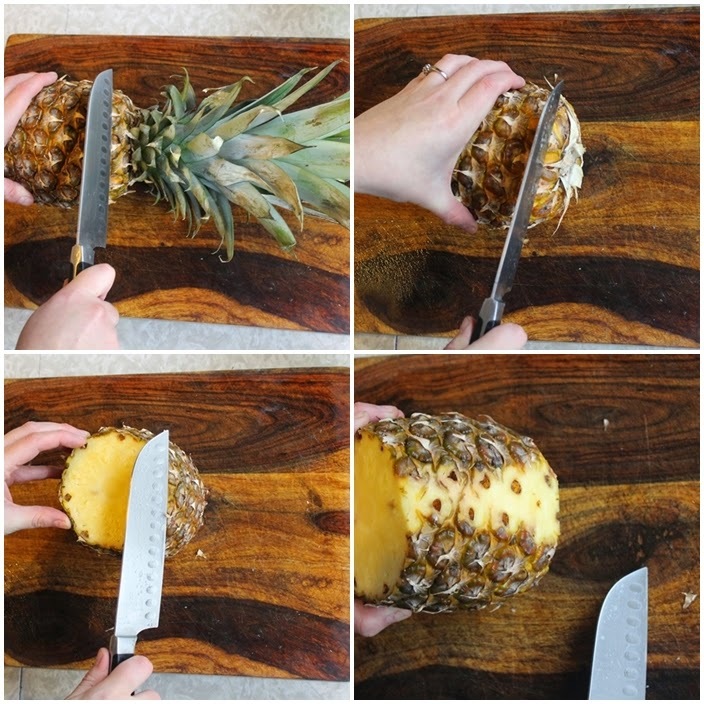 To Cut a Pineapple, you will need a cutting board and a good heavy knife. Chop the Top off, just an inch or two below the leaves. Some people leave the top on till the last minute to use as a handle. Stand it up on its end and begin slicing off the skin. This part took me about 3 pineapples before I was totally comfortable and always cut it at an even rate but take your time and you'll get it. You don't want to go too deep and waste the pineapple. I've seen a ton of internet tutorials and people always waste so much by cutting in too deep. I you start too thin, you can always slice a bit more off. Turn the pineapple as you go, slicing off the skin. Now for the little pokies. This is where the magic happens. Set the pineapple on its side and at an angle. You will notice that the eyes have a diagonal pattern to them. Spot 2-3 of them and cut at an angle. Now move your knife to the other side and cut at another shallow angle and they will slide right out. 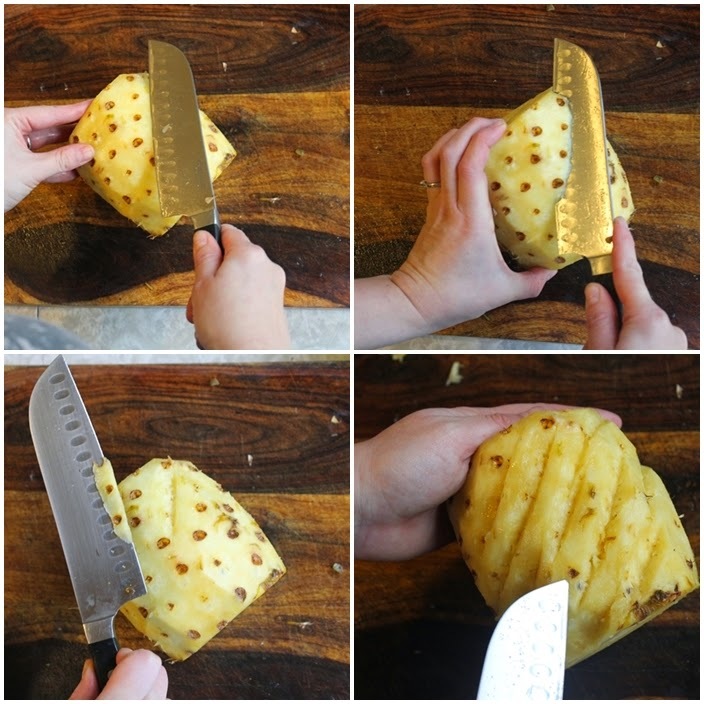 Do this all the way around the pineapple. Yes, you can use a spoon or small knife or whatever to dig them out individually but this goes pretty quick and you're left with a beautiful fruit and very little of the sweet juice squished out. I tried digging them all out before and I ended up mutilating the poor thing! Always cut at the same angle, even if you have a few single ones to pop out, no big deal. When you're done, the whole pineapple will have this beautiful spiral pattern around. Olivia is always sitting next to me while I'm cutting pineapple so she gets to chew on these little "bits" as she calls them. You may also toss them into a smoothie or juicer. Set the fruit on its bottom and slice it right down the middle crosswise. Now you will have 4 sections. Set each section on end (or on its side if you're nervous about cutting yourself) and slice the core out of there. Again, I tend to go too shallow in fear of wasting fruit so you can always feel for the rough bits and slice them off as needed. Next, cut these sections into 2-3 spears or however big your family likes them. The core still has some sweet juices and scraps of tender fruit. When Grandma was a girl, she and her brothers were sent out on the porch to chew the juices out of the core. Now, she stashes them away in the freezer for a wonderful high fiber addition to a smoothie. They don't last long enough for smoothies in my house- the kids and Pj usually devour them! Finally, you're ready to cut the spears into tidbits. BRILLIANT! As I said on IG, my dad taught me how to prepare a fresh pineapple. I love the tips you shared, especially the turning it upside down and cutting the little nubbies off! Thank you for posting this and thank grandma, too! I would definitely love to try this method! We're always buying pineapple so I'll be tempted to do this the next time we go grocery shopping. Thank you for sharing! This is super helpful! I'm going to show this to my mom, as she LOVES pineapples! Thank you, and thank your grandma! Love this! My husband always cuts pineapples up for me because it's such a pain. I'll have to try this method! Dang! When you got to the pokey bits, I cheered (that's the part that just does me in). Hooray! All people in household will review this method! Thanks! And do thank your Grandma! Pinning this now! I've mutilated far too many pineapples for too long!